I wish I was a bear. Not the cuddly fluffy kind but the sort that slopes off to the bunker to hibernate through the dark, wet, winter months. Such an appealing thought but the real world beckons so stuff has to be done. The weather isn't even that cold yet but I find that I'm increasingly drawn to snuffling under a cozy blanket on the sofa after dark … perturbingly, that's about 5 pm. I'm often outdoors and have become a weather watcher, looking at the skies for signs of rain or, better, patches of blue. I find the isobars on the tv weather infinitely interesting as are cloud formations (so informative). My dad was a helicopter pilot when younger and reading the skies was an essential skill for his work; it's from my dad that I learned the basics of cloud watching. Then there's the old oak barometer in my parents' hallway which has fascinated me for years, tapping on the glass to see if it changes. I found it utterly magical as a child, in the way that it could forecast the weather. See? Even back then. In the same way that we're supposed to be influenced by the phases of the moon (if you believe such things), my body barometer has been affecting my energy since the weather changed at the beginning of the month. Up and down in tune with the weather. When it's grey and overcast, I'm challenged to structure my day into anything useful. Apart from a little bit of sweeping and tidying in the garden, I have done virtually nothing. (And, yes, I still have bulbs to plant having taken advantage of Crocus' half price allium sale.) Instead, I have been indoors sewing, cleaning, decluttering and redecorating. There's also been a bit of recipe research and I've made jars of delicious no-suet mincemeat for mince pies, blog post to follow. The dark evenings herald a return to the cave (sofa) and I can't seem to get through the evening without a quick snooze! In fairness, I haven't been totally slothful. I've been redesigning a small front garden for a client, a job that came out of the blue after I was recommended. I've no idea who by but, gosh, what a lovely confidence boost! It's been a joyful project to do and I'll share when I've finished. One very dark and wet evening a couple of weeks ago was particularly challenging. I'd been invited out to the Garden Museum and really dithered about going. Why? Because it was dark, because of the fifteen minute walk in the wet, because of the rush hour tube journey, because of what to wear, because of Waterloo or Vauxhall, both dismal areas at the best of times. What a wimp! But I gave myself a good talking to and went - luckily. It was a get together to celebrate the publication of The Flower Farmer's Year, a book by Georgie Newbery of Common Farm Flowers about growing cut flowers for profit or pleasure. I enjoyed a fabulous evening, bumping into old friends, making new ones, some delicious canapés and several glasses of wine quaffed in an atmosphere buzzing with floral love, chat and laughter. Utterly worthwhile. Thank goodness for my swift kick up the backside. I will, of course, be reviewing the book very soon as it's a keeper and flower growers might want to add it to their respective seasonal wish lists. On the upside, with even a small improvement in the weather, my energy is boosted and away I go. On one such day, I drove down to the south coast to visit my parents. 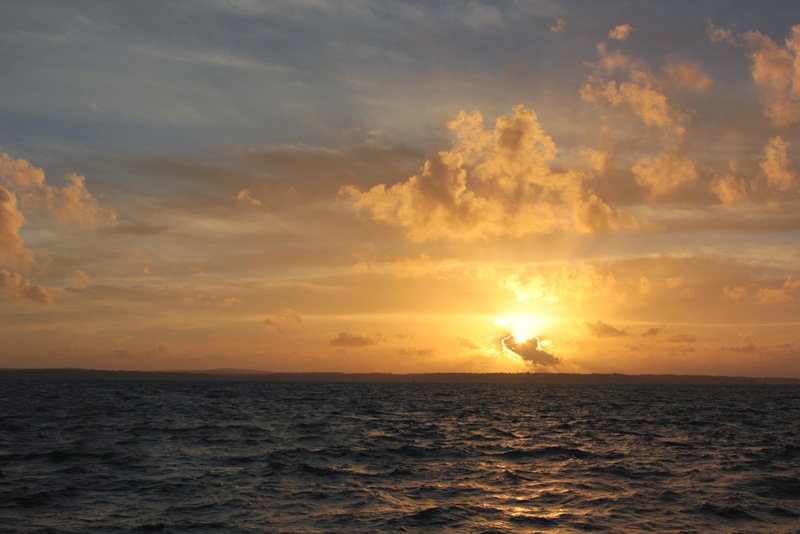 I went via the Meon Valley, cutting south through the beautiful Hampshire countryside, and just caught the sun setting over the Isle of Wight as I drove round the bay to my parents' home. Weekends there used to be about long walks on the beach, gardening and shopping in the outlet stores in Portsmouth; now the time is more usefully spent sitting quietly reminiscing, encouraging eating and drinking, looking after but not looking too far ahead. My mum (dementia sufferer) sometimes forgets the words she wants to use or what she's saying but she holds firm on her delight in having her children visit. My dad (Alzheimer's) is less forgetful but stooped and tired and nevertheless pleased to see us. I find it quite moving to see how these two go-getting globe trotters now sit quietly together, rarely moving outside the house but carefully looking after each other in their dotage after decades of devotion. There is a sense of the sun setting indoors as well as out. Acer leaves in the Capel 'woodland' area. 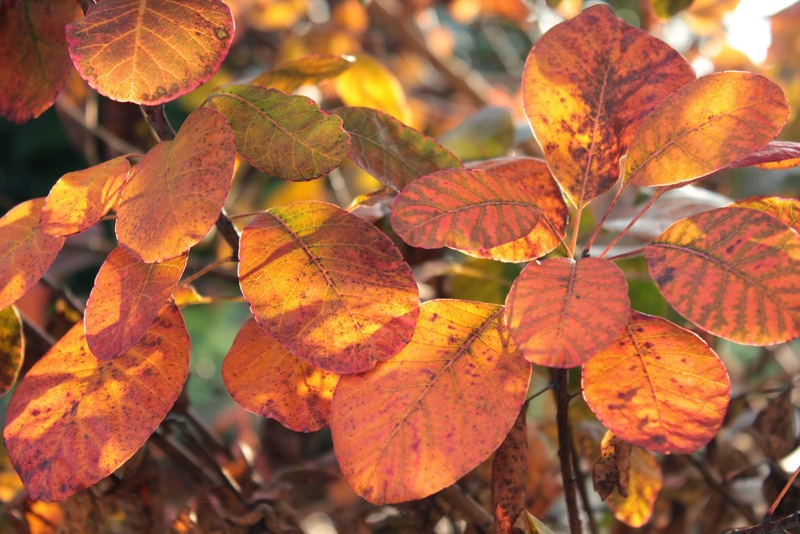 As I write this on Sunday afternoon, it's pretty much been raining for 48 hours here so it's uplifting to look at photos taken last week when I popped back to Capel Manor to check out a few plants before going on to a couple of nurseries. I was on familiar territory and it was a clear, bright day - perfect for a stroll around the grounds. It felt good just to be able to wander, taking photos, and seeing what was going on. I wanted to have a look at edible hedges in the Which? 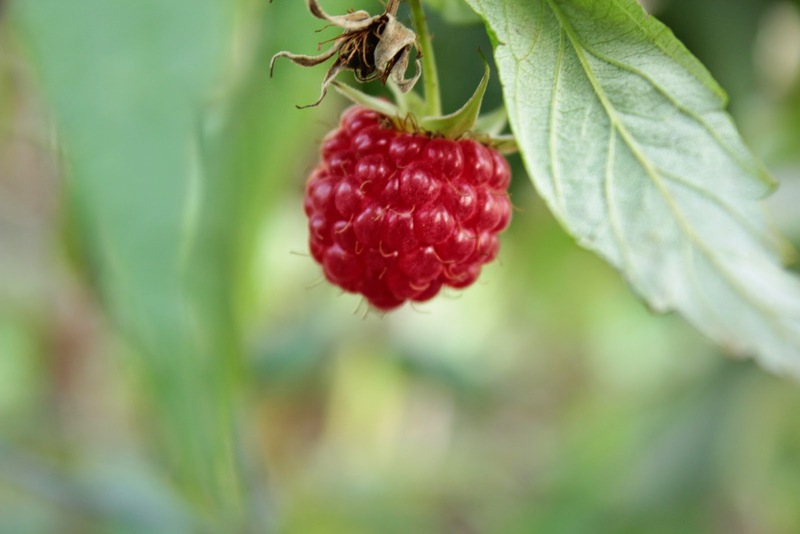 trial grounds and happened across a very tasty evaluation of late November raspberries … but I think that had better be another blog post as well. 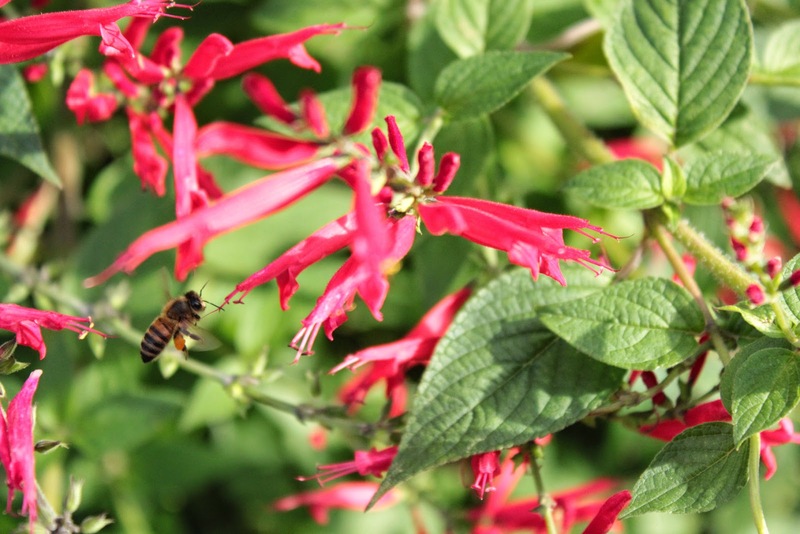 Pineapple sage - both leaves and flowers are edible. Amazing. Only two months left until the end of 2014 and I've spent a chunk of yesterday morning watching a bee gathering nectar and pollen in warm sunshine. 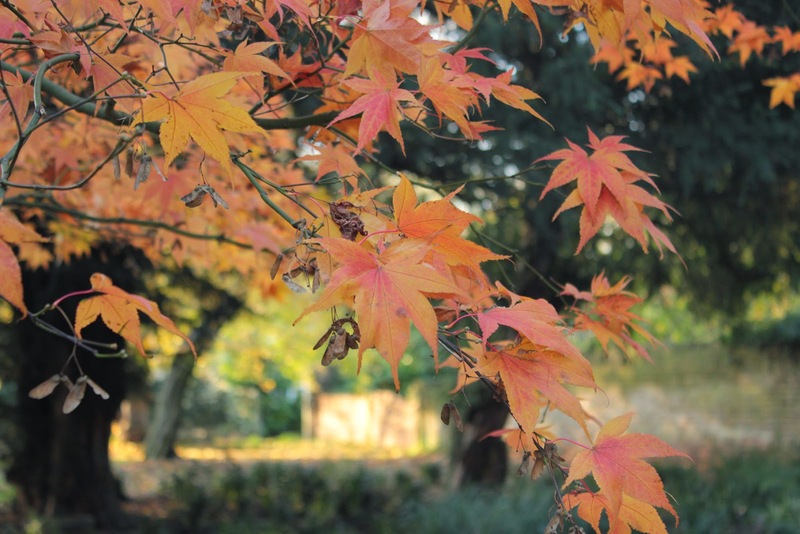 We've had the best of both worlds as autumn has surely arrived with wind, rain and slowly falling leaves but late summer is also just clinging on. I haven't even thought about putting the heating on yet or switching over to my winter duvet. October has been pretty decent, weather wise. The morning's walk through the garden had the feel of a misty autumn morning, the sun not yet risen and the veg leaves silvered with dew. The spider webs seem to have disappeared for now, thank goodness. I still haven't quite recovered from walking through a giant spider web spun between a tall privet hedge and my car. There was a delayed moment of realisation (and, yes, panic) when I saw a huge garden spider hanging from my hair close in front of my face. It was worse when it dropped and I couldn't find it as I was just off on a long journey. Hallowe'en, Shallowe'en - been there, done it. Apparently a winter Pimms is available. 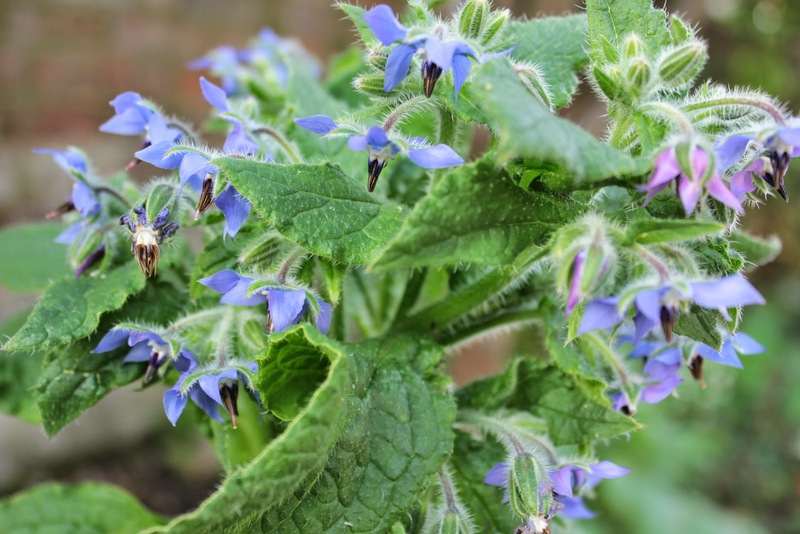 Borage, the perfect accessory. 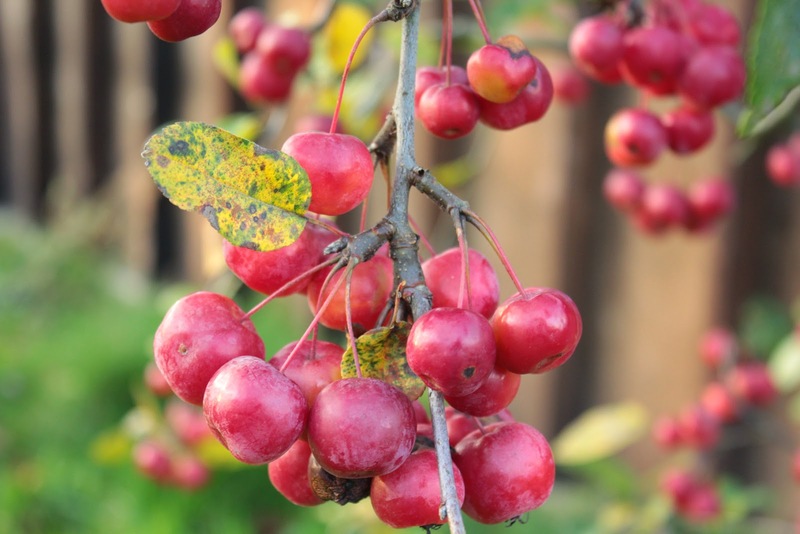 So, October finished on a gift of a warm sunny day. The soil in the garden is damp, making weeding a bit sticky (but quite achievable - take that, chickweed!) and the mild temperatures have prompted lots of growth, mostly flowers and herbs kicking out one last flush. 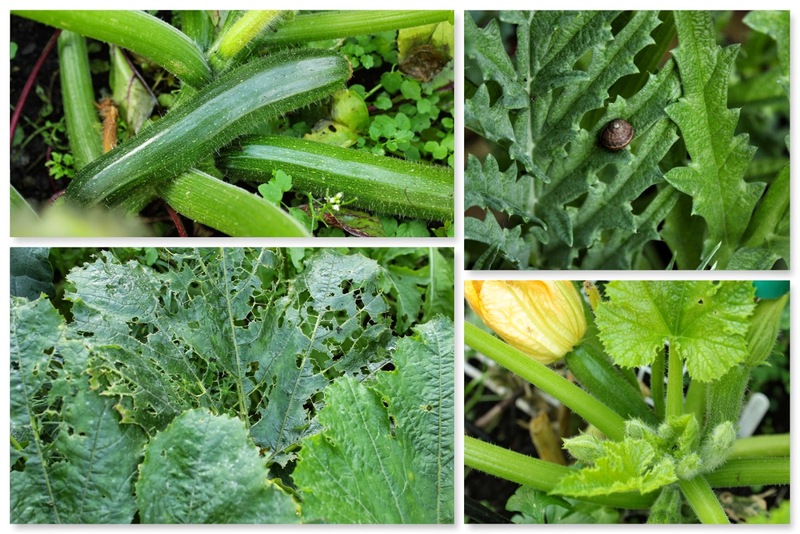 Most of the leaves have dropped from the fruit trees, the best borage plants ever are flowering in the garden - as are other edible flowers such as violets and edible daisies (Bellis perennis), and I'm still picking a few courgettes. I'm still waiting for signs of any saffron crocus flowers, so far only leaves but I can be patient. And the nasturtiums … more floriferous than ever. By the way, nasturtium flowers look and taste very nice with home-made mushroom soup. A few bush bean pods were left for next year's seeds. The weather has been dry enough to leave them on the plant but I think now would be a good time to pull the plants out and hang the pods up to dry, leaving them any longer would be chancing it seeing as tiny snails are bulking up on the green buffet in my garden. The big surprise of yesterday was seeing the first head on my broccoli plants. I was a bit slack with my brassicas this year, sowing seeds into modules in mid-May and then not potting the plugs on until end of June. These little plants then didn't go into the veg patch until early August. Privately thinking I'd left it a bit late, I remained hopeful and the weather was kind. Looks like I'll have broccoli after all which is great as it's a constant on my shopping list. 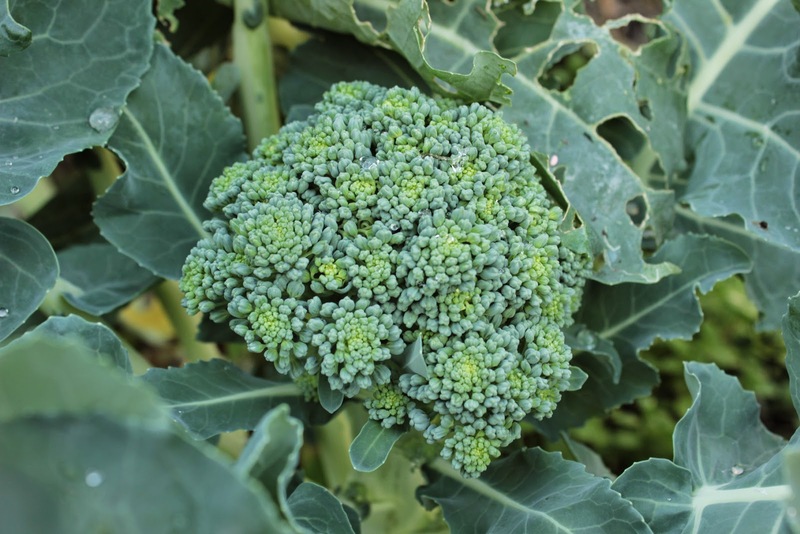 I've grown several types as they were labelled 'Autumn' broccoli, 'Christmas broccoli', 'Early Spring' broccoli - so, experimentation and weather notwithstanding, that should keep me in greens for a bit. The first head was cooked and eaten last night with a dusting of parmesan; it was sublime. 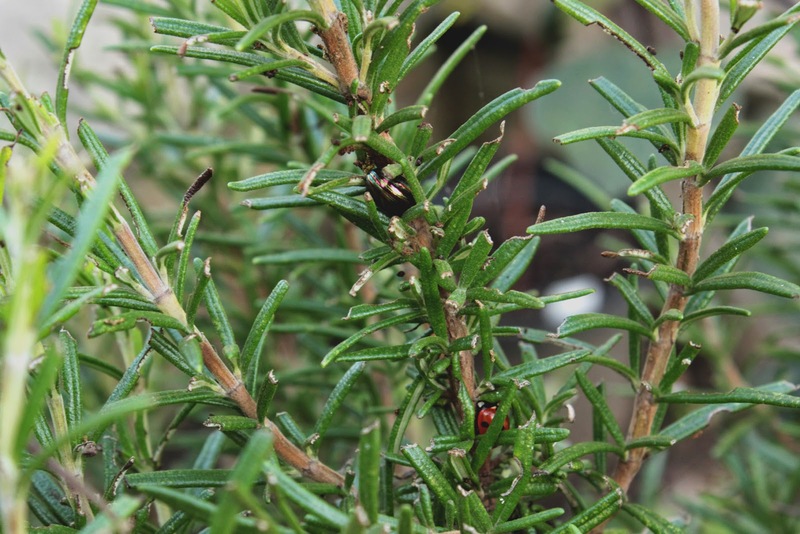 Not so good in the garden are sightings of Rosemary Beetle. I don't even have to spot the culprit to know that they're there as the tops of the rosemary leaves are all munched. This does not make for a happy gardener as I rely on my herbs throughout the year, especially the evergreen ones in the winter months. At this time of year, the adults have mated, the larvae have hatched and all will feed on the rosemary foliage until spring when the larvae will drop into the soil, pupate and emerge in early summer to start the cycle again. Can I offer some advice? Squish with extreme prejudice. It's hard because they're very handsome beetles but the alternative is dead plants or pesticides. And I say no to both those options; they have no natural predators. The beetles lurk on the stems but have a preference for the shoot tips as you can see. Moving into November, I'm choosing seeds for next year and sowing sweet peas and erigeron (daisies). Next week I'll dig out my seed packets and have look at any veg that I can start off now - peas and broad beans, I think - that can sit the winter out in a cold greenhouse or under polythene. The benefit of starting hardier seeds off now is that a strong root system will develop even though the top of the plant is doing very little. Result: earlier crops. We'll see. A Polka raspberry, still producing just a few berries. This may be the last. 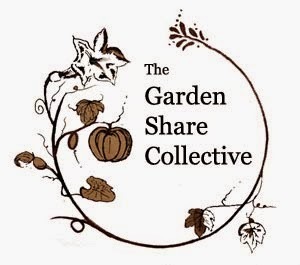 Joining in with the Garden Share Collective where garden bloggers from around the world share news of their food growing gardens.